I am going to write a separate, full post about the Disney Vacation Club (DVC), which will outline everything in more detail, but in the simplest terms, DVC is Disney’s timeshare program. The program currently operates thirteen resorts: nine DVC resorts at Walt Disney World and one DVC resort at Disneyland in California, as well as one resort each in Oahu, Hawaii, Vero Beach, Florida and Hilton Head, South Carolina. Or explore thousands of other vacation options in destinations around the world. Plus, when you purchase directly from Disney, you can enjoy the Disney Collection—which includes select Disney Resort hotels, Disney Cruise Line and Adventures by Disney—as well as the Concierge Collection. This morning, Steve and I were up bright and early to head to our Disney Vacation Club Open House Tour. The day before, whilst killing some time waiting for a dining reservation in Epcot World Showcase, we chatted to the Cast Member at the DVC stand in the Canada Pavilion. We explained how we had been on the tour in 2013, but decided it wasn’t the right time for us to buy. Since then, our situation had changed, and we were interested in going on the tour again, with view to purchasing. Complimentary Disney Vacation Club transport picked us up from our hotel – Wilderness Lodge (WL) – to take us to DVC Preview Center at Saratoga Springs Resort & Spa (SSR). Since the tour takes a couple of hours, we left Liam behind in bed – that’s teenagers for you! Children are welcomed on the tour, and can enjoy time in the supervised Kids Clubhouse, with Disney movies, video games, and more. When we arrived at SSR, we went through to the lounge area, where there is complimentary coffee, drinks, and pastries for you to enjoy, before the DVC Cast Member comes to greet you and take you into one of the presentation rooms. Around the top of the walls, are gorgeous pictures (made to look like stained glass windows) of all of the Disney Castles around the world. We barely had time to grab some breakfast, before the Cast Member came in to get us – you are able to bring your beverages/snacks in with you, so don’t panic like we did, and try and wolf everything down! The Cast Member we had was called Caesar – it was the same man that we had the tour with back in 2013. I don’t know if this was intentional (maybe they recognised our surname, and held records from our last tour) or just a handy coincidence, but it was nice to have a familiar face to go through the buying process with. We were shown a welcome video, and then Caesar went through how the DVC works – the different room types, member perks, how much it costs, etc. We then walked to the building with the model rooms and villas to take a look at what they were like – size, decor, room amenities, and so on. We were able to see a scale model of Aulani, a Disney Resort & Spa in Hawaii, as well as a deluxe studio room at Disney’s Polynesian Villas & Bungalows, one of the Aulani villas, and also the Grand Floridian Villa (which we saw on our 2013 tour, along with the Animal Kingdom Villas). You can request to see one of the Polynesian Bungalows at the resort itself. We didn’t get a chance to do that, but are going to take a look when we go on our next holiday to Walt Disney World. They look lush, but so expensive! All the rooms we saw were beautiful – I want to be able to stay in all of them! Disney does themeing very, very well, and their resort accommodations are no different. Since we were interested in the Polynesian as our home resort (more about that later), I’ll describe what is in the deluxe studio there, and you can see the photographs of the other resorts below too. The Deluxe Studio at Polynesian can sleep up to 5 people – 1 queen-size bed, 1 queen-size sleeper sofa, and 1 twin-size pull down bed, which isn’t pulled down in my photos, but when you do, there is a pretty painted scene of a Hawaiian beach, with Lilo and Stitch sleeping in a hammock, tied between two palm trees. There is a kitchenette, with a refrigerator, microwave, toaster, coffee maker, and sink; as well as cupboard space for your groceries, and other sundries. The Deluxe Studios do not have washer/dryers like the villas do, but there is a DVC laundry area you can use for free. I don’t have photographs of the closet, but there was a safe in there, along with an iron, and ironing board. One thing that we both noticed that was “missing” was a chest of drawers – normally, in the other Disney hotel rooms we’ve stayed in, there is one under the television, but in this Deluxe Studio, that space is where the pull down bed is (the TV is mounted on the wall here). However, in the bathrooms (yes, plural!) there are drawers for your smalls, and other bits and bobs. One bathroom has the toilet, bath/shower, and sink; the other has a walk-in shower and sink. That’s going to make getting ready in the mornings quicker when we stay! Of course, when we do, I’ll be giving a full, and thorough room tour! The colours were bright, and colourful, and I loved the tiki statue lamp too. I also like that the bed has a gap underneath it – handy for storing suitcases. Once we’d viewed the rooms, we headed back to the presentation room. to continue the process of purchase. We went on this Open House Tour with the intention of purchasing, however, at the same time, we wanted to check all of the facts, and figures, before signing on the dotted line, so to speak. When it comes to purchasing your Disney Vacation Club Membership, through Disney, you are only able to buy at the resorts which they are selling at the time. At the time of purchase, they were selling Polynesian Villas & Bungalows, and Aulani. You can buy via re-sale at other DVC Resorts, but these do not come with some of the perks that you would get if you buy through Disney. Whilst you can use your DVC points to stay at any of the DVC resorts (as mentioned at the start), you purchase what is called your Home Resort. You can book your Home Resort, 11 months out – that means if you want to go in November, you can book that in January. You can also book up to 2 weeks at a time at your Home Resort. If you want to book a Non-Home Resort, you can only book 7 months out, and only up to 1 week at a time. Accommodation at these resorts may already have been taken by those who own there, so you may to be a bit more flexible. Since we will be using our DVC Membership mainly for holidays to Walt Disney World, it made sense to us to have our Home Resort at the Polynesian, and not at Aulani, which is in Hawaii. The cost of points is the same – at the time of us purchasing it was $168 per point – but the amount of points you need for the accommodation can vary. So a weekend is more points than a week day, and it’s more points to stay during peak season (Christmas, for example) than during a low season month (e.g., September). We looked at the Points Chart for our Home Resort, and based on when we were most likely to take our holidays in the future, decided to buy enough for 2 weeks in September. We can use our points anytime, and anywhere, but we wanted to make sure we could have a two week holiday every year if we wanted to. As well as paying for your points, you also pay Annual Dues, which is to cover the upkeep of the properties. 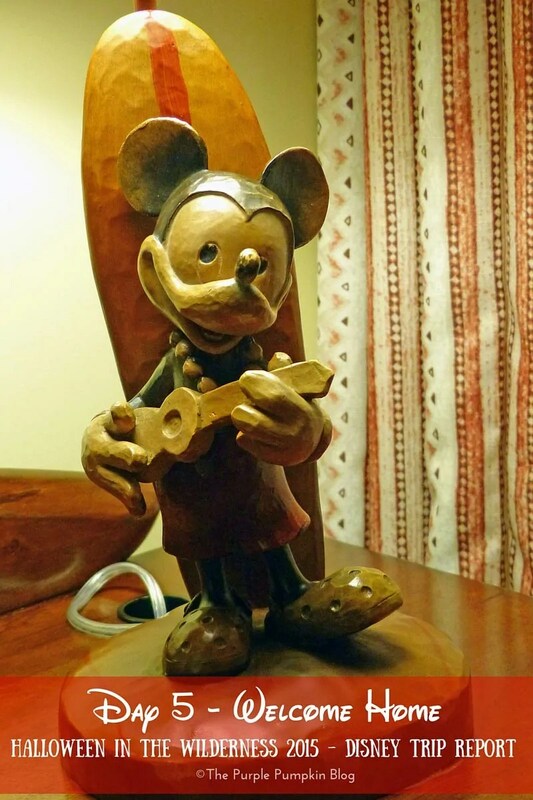 There is a lot more to say about the finer details, and like I mentioned earlier, I will write about more in depth in a post about the Disney Vacation Club. Back to what happened next: Caesar worked out how much everything would cost us – the total of our purchase, as well as how much the Annual Dues would be, and left us alone (with coffee, and more pastries) for Steve and I to discuss everything in private. I will say that never, in the two Open House Tours that we have done, have we felt pressured to purchase, or had any hard sell. It was at this point that Steve realised he’d left his wallet with our bank cards, back at Wilderness Lodge… we needed that to pay the deposit and closing fees! Caesar arranged for a car to pick Steve up and do the round trip to WL, while I just waited at SSR. Once Steve was back, we then had to go through closing, which is the legal side of things, and eventually, after we’d signed everything, we shook hands with the Cast Member, and were wished “Welcome Home”. We were officially Disney Vacations Members, owning at Disney’s Polynesian Villas & Bungalows. I actually cried with happiness!! Another perk of purchasing, was an additional set of points to match what we had bought! All in all, we had been at the Open House for around 4 hours! Much longer than the couple of hours we thought it would take, but the travelling to and from resorts for Steve wasted some time there, and the closing process also took a long time too. Whenever you go on the tour, you are given some FastPasses as “compensation” for the time you’ve taken out of your day to go on the tour, and you can also get a scoop of ice-cream on the way out too. We left the Disney Vacation Club Open House beaming, and were driven back to Wilderness Lodge, where we told Liam (who had roused from his slumber) the exciting news. By now it was late lunchtime, and we headed back down to the lobby, to grab some lunch at Whispering Canyon Cafe.